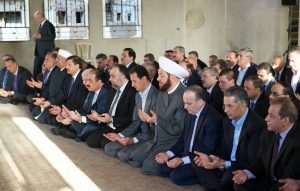 President Bashar al-Assad performed on Monday the prayers of Eid al-Adha (Feast of the Sacrifice) at Saad Ibn Muaz Mosque in Daraya city in Damascus Countryside. A number of state officials, ministers, MPs and Muslim scholars also observed the prayers, which were led by sheikh Adnan al-Afiouni, Mufti of Damascus and its countryside. Eid al-Adha festival, which marks the end of the annual Muslim pilgrimage of Hajj to Mecca, commemorates the willingness of Prophet Ibrahim to follow God’s command to sacrifice his son Ismael. Sheikh al-Afiouni delivered the Eid sermon, saying Eid al-Adha this year gives the Syrians hope for the end of the crisis in the country thanks to the Syrian Arab Army and the victories it has achieved. He also referred to the recent reconciliation agreements, where civilians and gunmen have been evacuated from cities in Damascus countryside and Homs, which he said indicates that those who want to go back on the right track always find the doors of the homeland open for them. Sheikh al-Afiouni saw in President al-Assad’s choosing of Daraya city to perform the Eid prayers an indication of embarking on reconstruction in the terrorism-stricken city after the evacuation of civilians and militants has been completed. It is also a proof that the Syrian state is honest and sincere in taking care of all parts of the homeland, he said. “Together with you Mr. President we will rebuild modern Syria and make it more beautiful, powerful and developed than it has been,” added al-Afiouni. 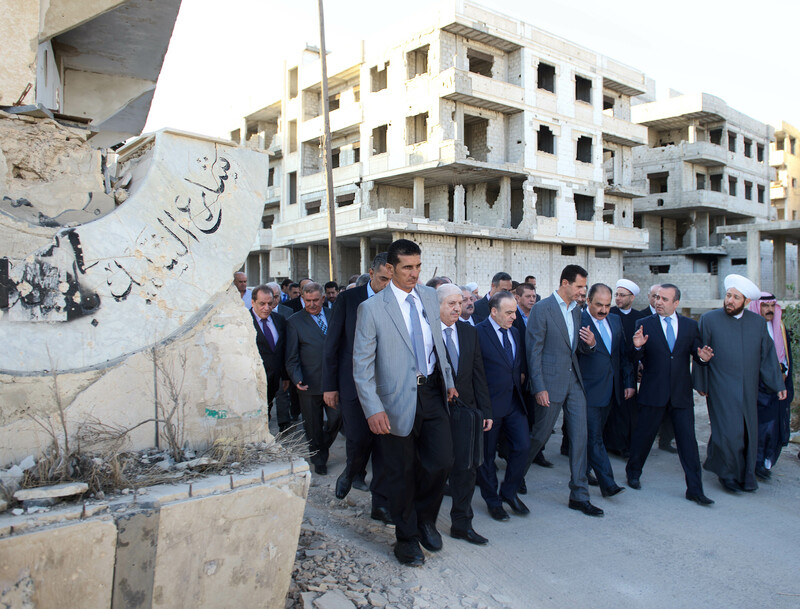 Following the prayers, President al-Assad toured a number of streets in Daraya city and saw the damage inflicted upon the infrastructure, places of worship and public and private properties due to the terrorist attacks. He listened to reviews by the officials concerned on their recent visits to Daraya city after the evacuation process and was briefed on the plans set up for restoring services to the city so that people can return to their homes as soon as possible. 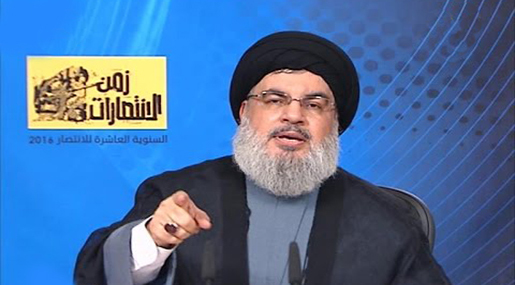 He added that the Syrian people have been aware of the reality of the conspiracy and the existence of traitors and agents and the external factor and share the same feelings whenever an area is taken by the terrorists, or liberated by the army or when a reconciliation agreement is achieved. The President affirmed that the message of his visit to Daraya is addressed to those who have worked against Syria and bet on its collapse, especially those countries that got directly involved in conspiring against Syria and supporting the terrorists and the Syrian traitors and agents who chose to be part of the foreign plot. “We as state, by coming to this area, also send a message to those [sides] that the Syrian state is determined to retake every area from the terrorists and restore security and safety,” stressed the President, adding that the state is also resolved to reconstruct all that has been destroyed physically and on the human level. “We come here today to replace the false freedom they tried to market at the beginning of the crisis, including about Daraya, with the real freedom; the freedom that starts with restoring security and safety, goes through reconstruction and ends with the independent national decision,” said President al-Assad. The President dismissed as “malicious” and “dangerous” the talk about “demographic changes” being attempted by the Syrian state in the areas taken from the terrorists or where reconciliations happen. He went on saying that this talk targets not only Daraya but Syria as a whole as it aims at creating the impression that the Syrian society is dismembered where social groups are at odds with each other to show that the Syrian cities are divided along sectarian, racial or religious lines. The President however affirmed that there is no need to worry about this issue as this game has been played so many times, and that it has now become difficult to market such a concept as “demographic change” because the Syrian people have high-level awareness and they have learned a lot throughout the crisis. As for his message regarding the areas that are still under the gunmen’s control, President al-Assad called on the Syrians to walk towards reconciliation, stressing that experience, especially over the past three years, showed that the Syrian state has kept all its promises and has always been open for reconciliation and for stopping the bloodshed. The doors of the homeland, he reiterated, will always be open to those who want to get back on the right track at any time and at all levels . “However, those who are determined and insist on acting as tools in return for a handful of dollars, we simply say to them ‘the armed forces will continue their work unhesitant and undaunted and regardless of any internal or external conditions until restoring security and safety to all areas in Syria,” the President said.